Christmas is the one time of year when anyone who plays an instrument is expected to entertain friends and family at some point. Which can be quite daunting if you don’t have something easy and recognisable to play. Particularly if you’re full of the Christmas pudding. But it’s nice to be able to entertain the people who have helped you along the way with encouragement, uke gifts and patience during twanging practice. 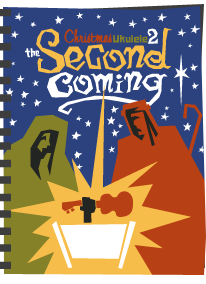 With that in mind, I’ve kept the arrangements in this second Christmas ebook as easy and playable as I can. To make sure flubs and fumbles are kept to a minimum while you’re centre of attention. If you haven’t bought an ebook from me before, you can find full details of the process here. And if there’s anything else you need to know send me a message and I’ll get back to you. They’re all arranged without any fancy finger work. The picking hand can all be done with the thumb. And the fretting doesn’t go higher than the sixth fret. Written for high-g tuning. – Super-simple melody arrangements of all those tunes. Only one note at a time. For high and low G.
– A PDF with a bit of history of the songs (sometimes more accurate than others) and tips on playing the tunes. – Additional downloads of: standard notation of the tabs, mobile-friendly downloadable videos, MP3s of the full versions and the melody-only versions. Quick warning: if you’re using iPad/iPhone/Android you can’t download directly to your gadget read this for more info. Al did a great job making many Christmas carols accessible for every ukulele player. Nobody will be afraid to take on his arrangements, and this is quite an achievement! Wilfried also made a video of the While Shepherds… tab from the ebook. I’ve played through a few of these already. They are easy and fun. Also love the cover design. Thanks for these, they’re nice and straight forward to play but sound really good, well done! Great book Al. The book is well worth the full price. Here’s what the melody-only versions sound like. The melody tab also has chord names so you can be accompanied by a friend. Or if, like me, you’re a badass loner you can play along with these mp3s. They’re split so the left hand side has the chords and the right has the melody. If you haven’t bought an ebook from me before you might want to read the FAQ page for more information. And if there’s anything else you need to know send me a message and I’ll get back to you.